NANAIMO, BRITISH COLUMBIA–Armed Ontario Provincial Police (OPP) entered the Six Nations Territory of Douglas Creek in Caledonia, Ontario – about 20 kilometres east of Hamilton - on September 19 of this year. According to witnesses, the OPP jumped a resident, “beat him down,” and arrested him while threatening other residents not to interfere. The Crown, after repeated arrests and jailings, reached a deal with the defense on September 29 to have activist Shawn Brant plead guilty to involvement in two blockades in Desoronto, Ontario, in April 2007. The Crown agreed to drop all but three of the mischief charges, with Brant to receive a sentence of time already served pretrial, a 90-day conditional sentence, and one year of probation. Incarceration of First Nations people has been the long-standing strategy for Canadian authorities. In the vein of this recommendation, it is important to note that culturally insensitive and racist proclamations have long been a part of the Canadian criminal justice and political establishment’s make-up. Meanwhile, provincial authorities continue the use of aggressive strategies in disputes with Original Peoples. At Barriere Lake First Nation, in October of this year, the Quebec police used tear gas and “pain compliance” techniques against peaceful demonstrators, including elders and children, said witnesses. Our objective is to continue until there is not a single Indian in Canada that has not been absorbed into the body politic and there is no Indian question, and no Indian Department, that is the whole object of this Bill. In 1991, the Kanienkehaka community of Kanesatake was at odds with the township of Oka, ON over the township’s proposal for a golf course expansion and condo development on land claimed by the Kanienkehaka. The Sûreté du Québec, Royal Canadian Mounted Police (RCMP), and the Royal 22nd Regiment were brought in to break up the Kanienkehaka blockade. Racism was heightened by the Oka Crisis. Warrior Publications informed of “white mobs” burning and hanging effigies of Kanienkehaka warriors from lamp posts. In 1995, a group of Original Peoples had gathered to hold the previously banned Sundance ceremony at Ts’peten (Gustafsen Lake) in central British Columbia. There the celebrants were accosted by ranch hands and told to vacate the land. This led to a major standoff over the unceded Secwepemc land of the Canoe Creek First Nation. 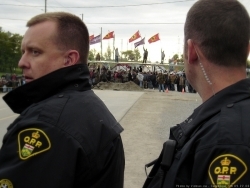 Prior to the mobilization of the RCMP at Ts’peten, Bruce Clark, legal counsel for the Ts’peten Defenders (as the defenders of indigenous title were called), informed the RCMP that action against the Sundancers would be illegal according to international and constitutional law. Fifteen of the 18 Sundancers at Ts’peten were found guilty, including Secwepemc Elder Wolverine (William Jones Ignace), who was found guilty of mischief to property and other crimes. Wolverine contended that ranch “owner” Lyall James was a squatter on indigenous land. Clark stated that the treaty process is designed to “extinguish the Indians’ natural law, international law and constitutional law right of jurisdiction that otherwise is not supposed to be ‘molested or disturbed’ by domestic crown governments, their courts or their police.” Clark implicated the judiciary in the “theft of jurisdiction” and cover up of genocide. An RCMP management team video depicted Ryan relaying orders from Superintendent Len Olfert: "Kill this Clark and smear the prick and everyone with him," and, "Clark is a goddamned snake." Kim Petersen is the Original Peoples Editor for The Dominion. For more on Canada's strategy of incarceration, see "Land & Jail: Ipperwash, official racism, and the future of Ontario," also by Kim Petersen. Can There Be a Salmon People Without Wild Salmon?